I stayed up until 4 a.m. last night reading Lynn Sherr’s biography, Sally Ride: America’s First Woman in Space, an unwise choice, given my schedule for today. Now, I’m sitting on my flight home to Seattle from NYC, where I just finished it, sniffling quietly, hoping my seatmate doesn’t notice my tears. After I read the last page, I spent several minutes flipping through the photographs in the center of the book, staring at the various renditions of this famous woman, pictured from infancy into her fifties, then rereading snippets of pages, marveling at her complexity and wondering at the price she paid for the choices she made. It’s an amazing story of a remarkable woman. I am crying again as I type. I don’t really know why, though. Yes, Sally Ride inspired me. Purposeful, poised, fantastically competent, wildly successful, all that is true. Beyond being the first American woman astronaut to launch into outer space, she advised Presidents, served on national commissions, founded a social enterprise (Sally Ride Science). But at heart, she was a scientist who loved sharing her passion for physics and learning, asking questions and seeking answers. She not only showed what women are capable of doing in an era far different than today and paved the way for others to follow her, but she helped widen the road for all girls to imagine themselves doing anything they set their sights on. 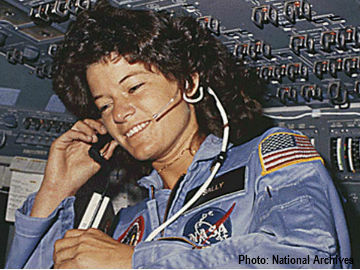 Not merely an advocate for expanding girls’ access to science and improving science education for everyone, Sally Ride created innovative and engaging learning opportunities that reached millions of girls in their critical learning years and altered their self-perceptions and their futures. Countless girls not only discovered science, but developed their own lifelong passions for delving deep into the universe’s many mysteries. The litany of Sally Ride’s accomplishments is impressive, but it was her authenticity that really struck me. That’s an odd thing to say, because she hid the fact that her life partner for 27 long years, way back to 1985, was a woman. She never mentioned that fact in public, and only on extremely rare occasions did she acknowledge this most intimate and important of relationships to her friends. In fact, she even lied outright on occasion to keep her secret. Of course people in her inner circle knew, but they followed her silent lead, in collusion to keep not just her image pristine, but her ability to impact others’ futures intact. What did that cost her, I wonder? I fell in love with a woman for the first time in 1982. A year later, unable to align the mismatch between my public face and my private passion, I unceremoniously dumped my girlfriend. I hated myself for doing it, but I hated myself more for feeling like a fake and a liar. The risk of losing the respect and love of people important to me was simply too steep. So, I sacrificed a core part of myself, and kept it underground. So deeply did I bury this part of myself that I got married 18 months later, created a family with my husband that grew to include three children and simply forgot that I might be gay. But can one forget something so essential about oneself? Sally Ride led a bifurcated life too. She didn’t forget part of herself, she just chose not to present it to the world. I am fascinated by her success in transforming the world while hiding part of herself. She was hyper-aware that her success would determine the extent of opportunities for the women who came after her. That was a responsibility she both welcomed and respected. And clearly, a pragmatist to the core who faced the facts despite the potentially high emotional cost of doing so, she was determined to succeed, as much for herself as for the future. I understand Sally Ride’s decision to remain in the closet. In seeking to change the world’s outlook in important ways, she rightly sensed that public awareness of her sexuality would only hurt her ability to fulfill her highest purpose. Painful to admit, but she would have accomplished far less. Sally was deeply wedded to generating social change, and I can only admire her willingness to keep that goal front and center. Courageous and authentic, she lived her life to accomplish what she saw as most important. Looking from afar, I’d guess Sally was satisfied with the life she led. She reached for the stars and got damn close. She didn’t stop to ponder the trade-offs, she just did what the job required. Her longtime partner, Tam O’Shaughnessy, Ph.D. maintains that Sally was an optimist, always looking forward, not one to regret or resent past events, although she also consistently avoided delving deeply into her feelings. That approach makes sense. Keeping focused on the public good likely gave Sally Ride enough sustenance to justify her secret-keeping. I’m only sorry she wasn’t able to live long enough to realize the progress of American culture and relax the rigid boundary between her public image and her full identity. Now I know why I’m crying; because Sally gave up so much to give us so much. Ginny Gilder is two-time Olympian, a serial social enterprise entrepreneur, co-owner of WNBA’s Seattle Storm and a dedicated humanitarian. The mother of three children, step-mother of two, and grand-mother of one, Ginny lives with her wife, Lynn, and their two poodles in Seattle, WA, USA. Her memoir “Course Correction” will be released April 14th, 2015 from Beacon Press. This entry was posted in Inspirational, Mother, Wife, Women and tagged Astronaut, female entrepreneur, Ginny Gilder, herstory, humanitarian, inspirational women, Inspired by my mom, inspiring story, inspiring women, Olympian, Sally Ride. Bookmark the permalink. Wow thanks for this – I read Judy Resnik’s biolgraphy years ago, she was the second American woman in space and died aboard the Challenger. I was so inspired and will definitely be reading Sally’s biography now I know about it as well. Thank you & glad you enjoyed it. Very inspiring article. I am familiar the the more mainstream bits and pieces of Sally Ride’s life, but have not read the book. As an “extreme” introvert I will confess I have mixed feelings about any sort of labeling or exposing one’s personal life for public consumption. It may be naive on my part, but I dream of a day when a man or woman is simply that rather than a white or black man or a gay or lesbian woman. Labels tell me nothing about a person’s character and that’s really all I care about. Thanks for the great read! Thank you & I’m glad you enjoyed this post from Ginny Gilder. I too yearn for the day when a person is a person without labels.